Paying due respect and attention to all stages of the craft; from the creation and ingredient sourcing, to relationships with suppliers and consumers, the nature of the brewery’s brewing process – using only the freshest ingredients – means UnBarred doesn’t have a ‘core’ range of beers, per se. Instead, each of the brewery’s beers are intentionally innovative, inspired by some of the best brews in the world. The natural brewing process relies on avoiding filterings and finings, using natural carbonation for a soft and distinctive body. 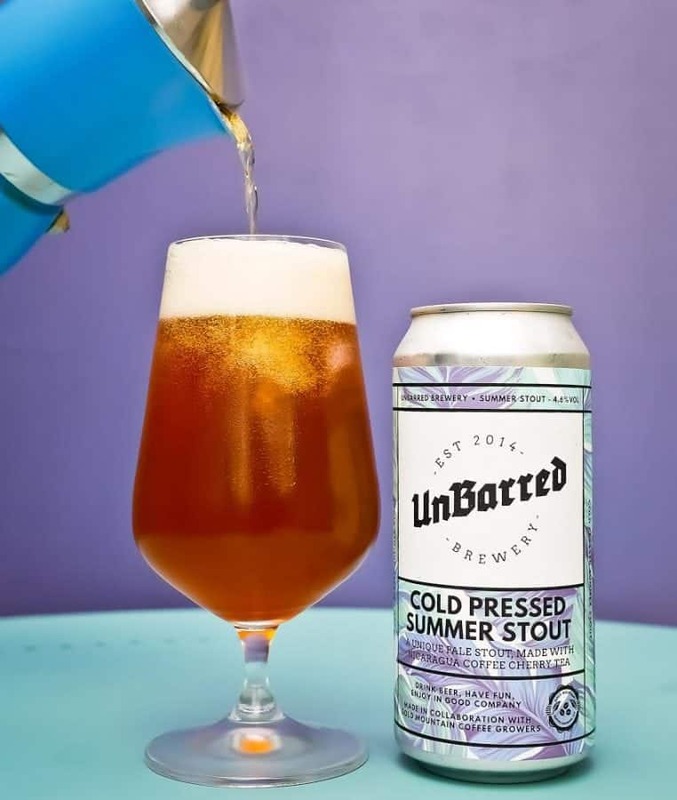 A collaboration with Gold Mountain Coffee Growers – a social enterprise connecting farms of exquisite specialty coffees directly with coffee roasters, in order to empower coffee farmers and their communities – UnBarred’s Cold Pressed Summer Stout is made using Nicaraguan coffee cherries of the Pacamara variety. Replacing typical roasted dark malt with smoked pale malt and cocoa nibs, the unique pale stout showcases both the cold press coffee and the fruit character from the Coffee Cherry Tea used. When poured from the can, the stout has an amber, surprisingly clear complexion; capped with a foamy off white head. On the nose, prominent coffee notes are backed with chocolate and dark stone fruit aromas, finished with some underlying pine resin and complex malt character. Further coffee notes are omnipresent on the palate, harbouring some refreshing bitterness and joining a fairly classic stout flavour – albeit considerably lighter. The medium-bodied beer also imparts savours of sweet dark fruits, dark chocolate and a whisper of lactic presence which wanes as a final flourish of cold-pressed coffee and slight fruit sweetness dominates the long finish. Further information on UnBarred Brewery can be found here.